LAS VEGAS, NV--(Marketwire - Sep 10, 2012) - JCM Global's iVIZION® bill validator has been setting incredible sales records to become the company's most successful product, and now iVIZION is setting a new standard for performance as well. Penn National Gaming's Hollywood Casino Toledo opened with iVIZION exclusively installed on all of its 2,000 devices, and Horseshoe Casino Cleveland opened with iVIZION on 100 percent of its 2,100 slots. From opening through July, iVIZION bill validators processed a combined total of more than $1 billion at the two properties. Achieving outstanding performance in the face of tremendous volume is nothing new for iVIZION. Late last year, iVIZION processed more than $14 million in just 10 days at the newly opened Resorts World Casino New York City. "iVIZION's amazing, record-setting performance at Hollywood Casino Toledo and Horseshoe Casino Cleveland prove there are more than a billion reasons for every casino operator to use iVIZION. iVIZION has been proven to be the better, smarter, faster bill validator, and with its future-proof foundation of intelligent validation, iVIZION will continue to evolve to deliver even better services," said JCM Global VP of Sales Mark Henderson. At G2E, JCM is evolving iVIZION with an incredible set of bundled enhancement tools that empower casino operators to do much more than they ever thought possible, and in real time. iVIZION's bundled enhancement tools fulfill iVIZION's promise of delivering apps that keep it future-proof. Evolve with JCM in G2E booth #3631. JCM Global is the world's leading supplier of innovative automated transactions solutions for the banking, gaming and retail industries. With unsurpassed service and support, JCM Global is trusted by operators, manufacturers and integrators on six continents. 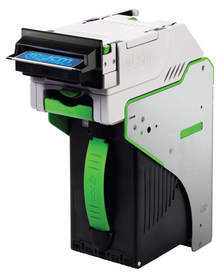 Its extensive line of award-winning products set global standards with ground-breaking products like the iVIZION®, Universal Bill Acceptor (UBA®) and Vega-RC™ bill validators, Intelligent Cash Box (ICB®) and PayCheck 4® thermal printer. For more information, visit JCM Global's 24-hour tradeshow at www.jcmglobal.com.